History/Mythology: Malachite has a very long history and has been dedicated to many deities over history. It has always been considered to be a woman’s stone and in history has always been connected to a female Goddess: Russia – Lady of the Copper Mountians (who is believed to be a personification of Venus), Egypt – Hathor, Roman – Venus, Creek – Aphrodite, Northern Europe – Freya as well as seen to be the stone connected to the Muses for its representation of seduction, beauty, curiosity and aesthetic theory. Malachite is a highly protective stone. It has the ability to absorb pollution that surrounds us, purifies or naturalize them and then shields us against further attack. Malachite absorbs energy from around us so that we remain calm and more able to cope with what is happening, once we are balanced it helps bring the emotions to the surface so that we are able to deal with them calmly and rationally. By helping us cleanse the past and break ties with it Malachite allows us to move forward and step out of our comfort zone so that we can make the changes we want to happen within out lives. For this reason Malachite has also been know as the ‘Stone of transformation’ due to its ability to cleans, heal and start the transformation process. Please be aware that Malachite has the ability to draw out and amplifies both negative and positive energies and should only be worn when you are prepared to deal with what will be brought to the surface. Due to its strong protective capabilities and its ability to absorb them malachite is a stone that needs regular cleaning. Malachite is also considered to be a stone of abundance which will help you to bring your goals or intentions into manifestation. Healing – Cleanses blood, immune system, skin conditions, asthma, arthritis, swollen joints, broken bones, torn muscles, cellular disorders, fine tunes metabolism and assists with the endocirne system, easing menstrual cramps and assists with childbirth. Malachite should only be used for short periods of time due to its strong transformation effect. Can be used in all meditations for protection, transformation and manifestation purposes. Malachite can be placed on the Third Eye while meditating in order to active the pinal gland and enhance your physic ability. 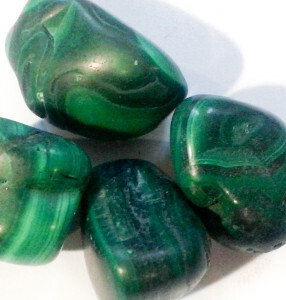 Healers will find malachite a very useful stone particularly when working with issues/matters of the heart. Used as a shield to assist against Radioactivity. NOTE: Please be aware that there are a lot of fake malachite Jewelry on the market and only buy from a Trusted seller.